Unless you've been hiding in the arctic circle for the last six months (easy to do), you know Microsoft CEO Steve Balmer has retired, and the company was searching for a replacement. And unless you've been frozen for the last six hours, you know they have chosen insider Satya Nadella for the job. Everyone seems quite sure he's the right guy for the job, despite the fact that it took six months for the Microsoft board to pick him. Like everyone I wish him luck. Because he's going to need it. Microsoft is a huge successful company which has thousands of successful products found on nearly every desktop in the world, and in nearly every datacenter. They generate craploads of cash, and have a huge staff of bright motivated people. So what's the problem? Desktops and servers are no longer where it's at. Mobile is the future. And Microsoft is *not* found on nearly every mobile device in the world. Not even. Nearly everyone sees this and nearly everyone has advice for Microsoft and Mr. Nadella. Here's mine. Recognize that mobile is the future. Microsoft must become a player in mobile. Do not think that Nokia can compete for phone hardware market share. Just don't. Apple and Samsung have already won. Do not think that Windows can compete for operating system market share. Just don't. Apple's IOS and Google's Android have already won. Good news! The two dominant hardware platforms run the two dominant software operating systems, and they are both open! Thousands of companies are making millions of apps for these environments. That creates an opportunity. Microsoft should become a major player in app development. First, they should make their own apps which are seriously awesome, in the space they know best: Office. Microsoft Office Apps should rule. Right now there is a greenfield here with a lot of contenders but no clear victors. Microsoft already understands this market, they could be great at this. Second, they should provide services for everyone's apps which are seriously awesome. Virtually all Apps for both IOS and Android make extensive use of web-based services, for all kinds of things. Become the leader in providing these services. Right now there is a greenfield here with a lot of contenders but no clear victors. And there are lots of new categories. Search (Bing!). Mapping. Translation. Database access. Payments. Analytics. Image analysis. And of course, Visual Search :) Microsoft already has a lot of these capabilities, they are well positioned to be great at this. Third, they should provide infrastructure for the services used by everyone's apps which are seriously awesome. Virtually all back-end services are hosted. Amazon is the leader, with Rackspace and others definitely in the mix, but Microsoft's own Azure is already a player, and they are beautifully positioned to be great at this. [optional] Change your name to Mobilesoft. And mean it. That's it, free advice which is worth more than you paid for it. 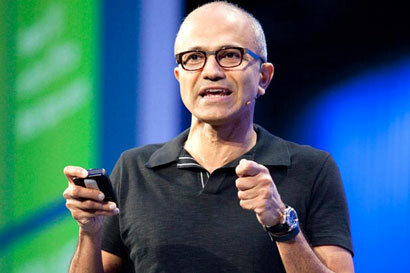 Good luck Mr. Nadella, and good luck Microsoft Mobilesoft.